A 'who's who' list of the best engineers of the period - Luis Bravo de Laguna, el Frattino, Tiburcio Spanochi - all offered - or had already offered - their suggestions, as did Cristóbal de Rojas. Very little is known of de Rojas. He may have been born in Toledo, perhaps in 1550's and may have been educated in the University of his home town. What is known is that Rojas made a name for himself as an assistant to Juan de Herrera in the construction of the Monastery of the Escorial. He later became an architect in Seville which he used as his home base for many years. 2 His 1597 book on the Teoría y práctica de la Fortificación - the very first on the subject ever published in Spain - reinforced his fame as a top-notch hands on man. A year earlier Phillip II made him his official military engineer. It was therefore not very surprising that the King seems to have preferred Rojas' proposals. The following year he ordered him to start work in Cadiz. 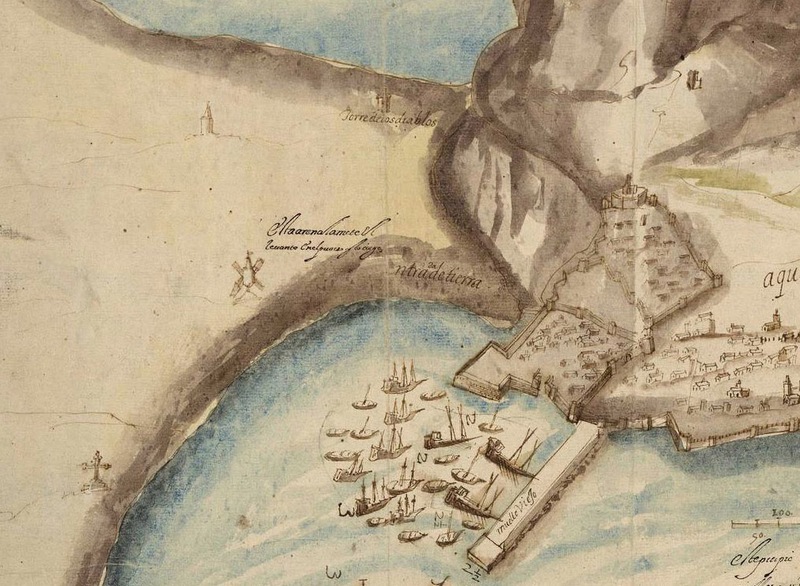 His instructions were to give preference to the fortifications of this city but also find time to inspect those of Gibraltar. In December 1598 after working in Cadiz for some time he managed to fit in a visit to the Rock and soon realised that there was far too much to be done for him to tackle it himself. 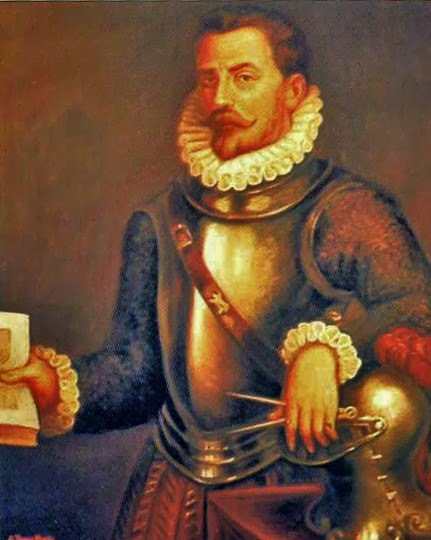 He advised the King that he should appoint in his place 'un hombre de ciencia y conciencia' and recommended another engineer - the Licenciado Cedillo - who in turn would receive help from the architect or Maestro mayor, Diego Rodriquez. In 1604 Rojas surveyed the Old Mole and found it in very poor condition. It was his opinion that unless something were done immediately, the coming winter storms would almost certainly destroy it completely. Meanwhile Marina de Bassosabal - the woman he had married in 160o - gave birth to Bartolomé de Rosas his one and only son. His constant voyages to and from Cadiz, Madrid and his home meant that his work in Cadiz suffered accordingly and his position as chief engineer became untenable. 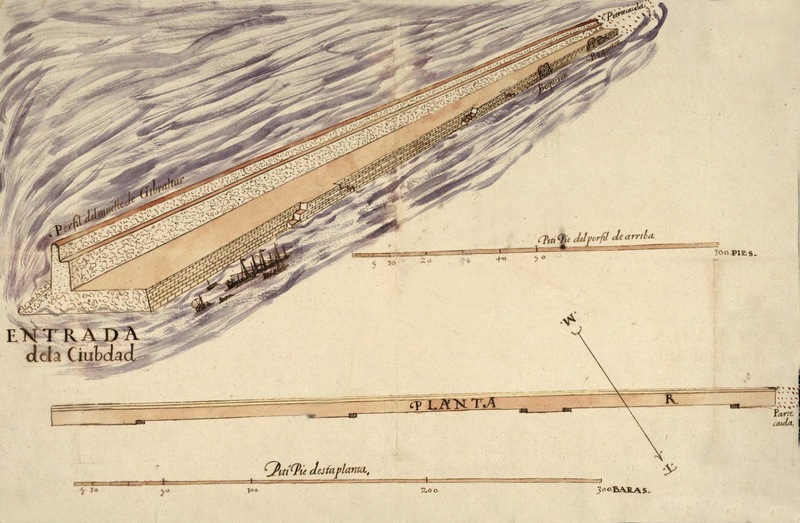 Meanwhile in 1606 the Italian Tiburzio Spanochi presented an estimate for the repairs of the Old Mole. 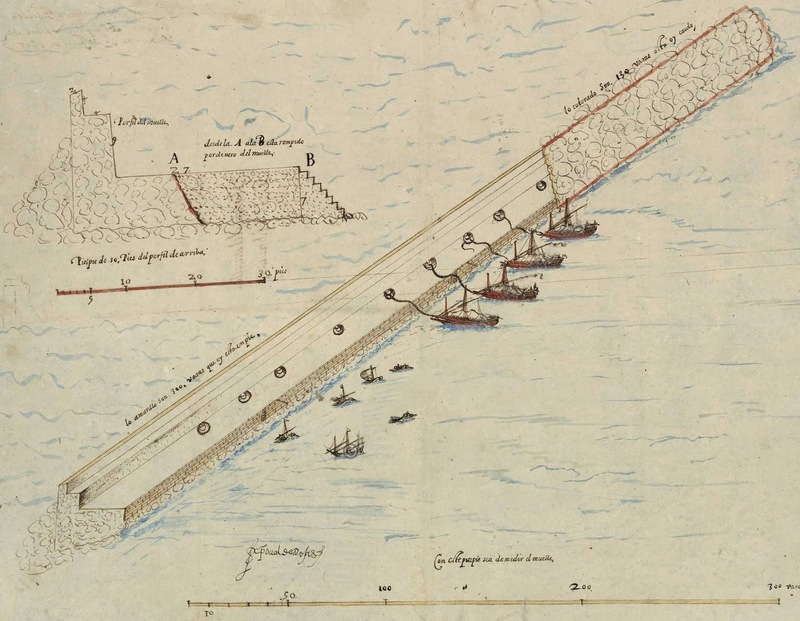 Despite the expense - 5000 ducats for the repairs and another 12000 in order to extend the length of the mole by some 200 feet - Spanochi's proposal were accepted and the work was promptly passed on to Rojas. This rather abrupt change of plan was almost certainly due to Spanochi's death in 1606 and the fact that Rojas was seriously in need of a job. Whatever the case, a serious lack of ready cash ensured that both the repairs and the reconstruction proceeded at a veritable snail's pace. The fact that Rosas essentially continued to be an absentee overseer during this period did not make things any easier either. Some twenty years later, Alonso Hernández del Portillo (see LINK) still remembered a time when the mole was practically non-existent. The delay proved catastrophic. 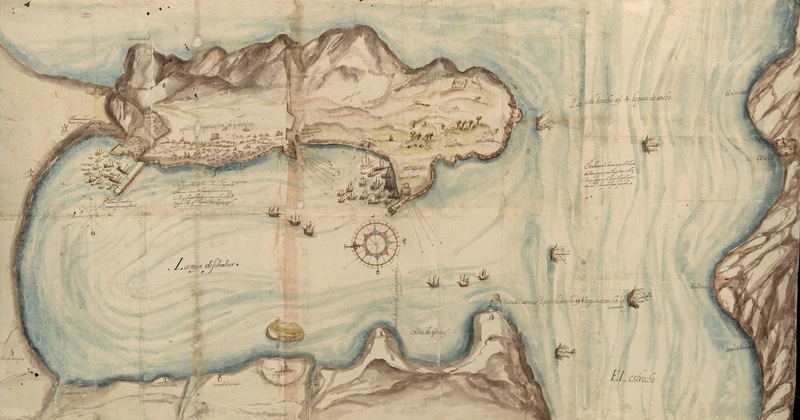 Two years later with the Old Mole still in a state of total disrepair, Spanish galleys under Juan Álvarez Davila's were heavily defeated by a Dutch fleet commanded by Jacob van Heemskerk in the Battle of Gibraltar. Rosas was recalled. 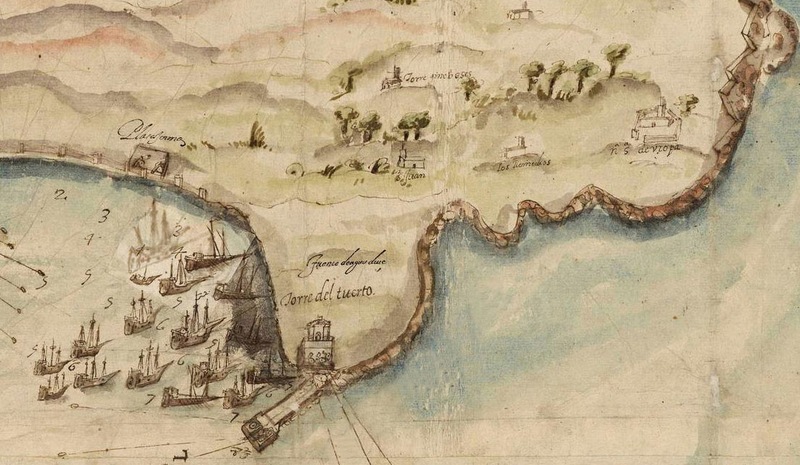 He arrived in Gibraltar in 1608 with Luis Fajardo, Captain General of the Neapolitan Galleys. They came to a very quick conclusion. The Old Mole still needed repairing and cleaning up and a new one needed building in the south. Rojas proposals for the Old Mole were sent to the Duke of Medina Sidonia who in turn passed the matter on to the King who approved them in principle. The engineer returned once more to Gibraltar with his Cadiz architect, Alonso de Vildevira and Luis de Taren well known for his work on the new mole in Malaga. Things seemed to be going well when Fernando Quesada Ulloa wrote to the Duke of Medina Sidonia confirming that everything was going according to plan. Rojas must have felt well satisfied with this state of affairs when he returned to Cadiz leaving Valdevira in charge of the project. The necessary lime kilns were set up in Getares close to Algeciras and the cost of the complete mole was estimated at 90 000 ducats - perhaps about £8 million in modern terms. This would include the building of the mole itself, a platform for canon where it connected to the land and a small redoubt at the end. It would take three years to build. Speeding things up so that it would take only two years would entail an expenditure of an additional 10 thousand ducats. Meanwhile the new Governor of Gibraltar, General Juan de Zuñega looked on with trepidation as the costs continued to spiral out of control. By the time the work had actually started in 1615, Rojas had lost all interest. He had died in Cadiz in 1614.